In the “too-big-to-fail” (TBTF) debate, we can argue about how much and what type of changes need to be made in financial regulation. However, on the five-year anniversary of Lehman’s failure, the question of whether changes have occurred since then are not debatable. They have and they are significant. This deck provides a short primer on what has changed in the five years since Lehman’s failure. The five-year anniversary of Lehman’s failure is not the five-year anniversary of the financial crisis, which began in 2007 and was systemic, affecting banks of all sizes and non-bank financial institutions. Policy changes since 2008 have sought to end TBTF by reducing the likelihood of failure and mitigating the impact of a failure on the rest of the industry and the broader economy. Compared to before the crisis, the six global U.S. banks have raised $290 billion more in capital, which is more than the amount of TARP funds disbursed to the entire banking industry. In addition, the quality of capital and liquidity levels has increased with new Basel III rules. Evidence from bond prices and statements from credit ratings suggest markets believe the government is less likely to bail out a failing financial firm. Legal changes prohibiting bailouts, new powers with Orderly Liquidation Authority, and the broad political environment have led to a change in market expectations. Additionally, higher capital and liquidity requirements and new premiums on non-deposit liabilities also act as a tax on size. Since the passage of new regulations, the market share of large bank holding companies has decreased from 68 percent to 63 percent. 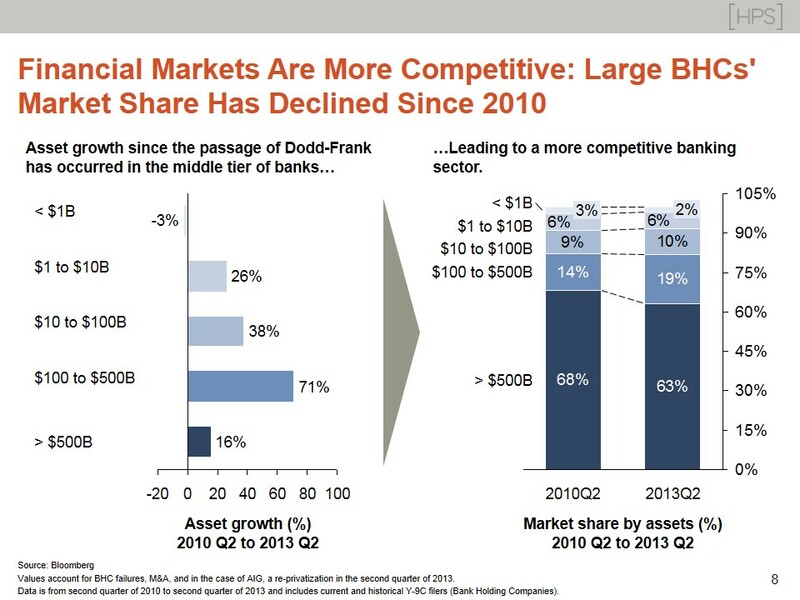 Contrary to popular belief, mid-sized banks have seen the largest growth since 2010, leading to a more competitive financial sector. Many emergency authorities invoked during the crisis to bailout financial institutions are now illegal. In 2008, TARP was voted on twice before passing. In the future, legislators will have to overturn elements of Dodd-Frank and also approve taxpayer funds to bail out institutions.